This year was one of the worst for my base (I spent 8 years there and retired from it.). We had 6 line-of-duty deaths not to include the other 7 that were either local accidents or suicides. That is 13 military that died fromthis one base this past year yet not a peep in today's paper except how this is the biggest tourist season ever. The suicides, almost always swept under the carpet for various reasons. I guess as to not cause a chain reaction. The line-of-duty deaths for this whole military community is around 15. I'm guessing the newspaper will do an article on it tomorrow since this year nearly doubles those of prior years. I've had the chance to be a part of many repatriations (first time remains hit US soil) in my time. One of the happiest yet saddest times ever. Sad in that the family finds out their loved one is dead, happy because they had been unsure for almost 2 decades. One of the most mixed feeling memorials ever. My base has been steady renaming streets in honor of those we've lost in the line-of-duty. Too many streets have been named. I had one coworker who lost his military wife (plane crash), watching him slowly go insane was not fun. Naming a street after her was just a painful reminder IMO. Sorry Kermit, that is rough. I'll remember this in a prayer. Hope you can still have a decent weekend. I scheduled poll worker supervisor training for this morning inadverntently forgetting the Indy 500. Well I can still see the Coca Cola 600. Thanks. Over time you kinda just get numb to it. My first co-worker that was killed was hit by one of our own trucks. No one would stay with the body to put it on the plane so I did. Since then I've toughened up in those situations. After that it has been aquantinces than friends anyhow. Mostly people I've trained. I don't do that stuff anymore but feel for those that are out there doing it. And another bump for this weekend. Thank you to all who have served and who are serving. Thank you for your service, enjoy the weekend. Last edited by MB DNA; 05-23-2014 at 02:51 PM. This one gets me every time I see it. Thank you to all those who have served, many who have given their all. The national colors displayed at my home came down to half-mast this morning recognizing those in uniform who gave their all; and they will rise to the peak again at noon, recognizing that our nation still lives, and that it always will. They will stay aloft until on the Memorial Days to come on each of those few years I have left, when they will again go to half-mast from sunrise until noon. Little Smart also proudly flies the colors today, as she has for all this long weekend. 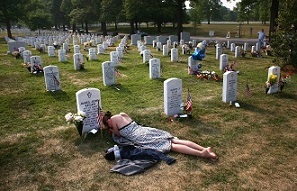 Why do so few of our citizens appropriately celebrate Memorial Day? Some years ago a Gallup poll found that only 28% of U. S. citizens even knew the reason why we have this national holiday, and it would appear that even fewer know why today, or, if they do, they don't care. This shocking ignorance which gives priority to hot dogs over the reason why we have a Memorial Day is unbelievable and unforgivable. More than 200 years ago George Washington told us that we must beware of those imposters who only pretend to be patriots. Those imposters now appear to be the great majority of our citizens. As I drive around this city which has a university which is second only to West Point in annually providing officers for the U. S. Army I am hard-pressed to find our colors flying. This is why the words "thank you for your service" have always irritated me when coming from strangers, as I only did for more than 24 years what I believed, and still believe, was my duty, and the odds are that they come from the mouths of imposters. As a Vietnam vet myself, I will often go up to another vet and thank him/her for their service. I have also gone on two Honor Flights as a guardian for a WWII vet and the treatment they received was absolutely awesome. I recall the feelings this country had for the Vietnam vets in the 60's and 70's and they/we are now starting to be appreciated a little bit more for our service and sacrifices. I do believe that our service personnel are currently being a little more honored and respected than they have been in the past. There is much more media coverage of those mental and physical injuries that our vets in the Middle East have endured and experienced and I think more of the general population is seeing it and appreciating it.